My hope is that gays will be running the world, because then there would be no war. Just greater emphasis on military apparel. I have told the following story approximately a million times, so I apologize in advance if you’ve already heard it. But it makes a good introduction. When my older sister was preparing for the brit milah of her first son, she told me that the ritual was barbaric in nature. “Everyone is sitting around fressing and celebrating, while a little baby is in pain” is how she put it. My sister, I figured, is a nut. Here’s a ritual that’s taken place among Jews for more than 3500 years, given to us by G-d Himself as a covenant, and she’s calling it barbaric. She’s just an avant garde, vegetarian, tree-hugging, anti-traditional, radical, extremist, liberal, I reasoned. And then, about six years later, I had my first son. Believe me, I am NOT an avant garde, vegetarian, tree-hugging, anti-traditional, radical, extremist, liberal. And apparently, neither was my sister. The ritual of Brit Milah suddenly seemed awfully barbaric to me. I stood at the back of the hall where the brit was taking place and cried. I went on to have two more sons. For both ceremonies, I left the hall altogether. By the time my grandson was born (the son of the son who had turned me into a radical extremist liberal), I almost didn’t come to the brit at all. I sat in another room, with my head on my knees, breathing deeply. All the boys came through the ritual far better off than I did. A brit milah might change a boy physically, but not emotionally or mentally. The army, however, is a whole other story. When I first came to Israel, the soldiers I knew or saw weren’t close enough to me to think about worrying over any of them. My male friends who went through the army were admired. They were applauded. They were drooled over. When my husband was drafted, it was for a shortened service and his basic training was about two weeks. He served for almost 20 years in the reserves, but not as a combat soldier. My friends had kids in the army over whom they worried. I sympathized. And then my son went into the army. And then my second son went into the army. And then my third son. When the first went in, I repeated the brit experience. I sat in my room and cried. For the second son, I decided to be brave. I sat in my room and breathed deeply. I allowed myself to cry only in the bathroom. The third was drafted during Operation Protective Edge. His brother was serving on the Gaza Border. I was no longer brave. I just cried, anywhere and everywhere. I learned a lot from my boys when they were in the army. I learned the names of the different army divisions – kita, machlaka, pluga, gdood, chativa (roughly – squad, section, platoon, company, and battalion). 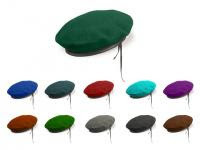 I learned the colors of the berets for the different battalions. Kalab (קל"ב) short for ‘karov l’bayit ((קרוב לבית) – close to home. Serving on the Lebanon border or on Mt. Hermon is not Kalab. Serving in Gaza is. Kumtah (כומתה) - a soldier’s beret. Each battalion has a different colored beret. Combat soldiers receive their colored kumtah only after a Masa Kumtah (מסע כומתה) – a 50 km hike in full battle gear (weighing approximately 40 Kg). At night. Only then, is he a real soldier. This is celebrated at the Tekes Kumta (טקס כומתה – beret ceremony), where the soldiers are given their berets in front of their families. I cried. Twice. One ceremony was cancelled because of snow. I cried it was cancelled. I learned that soldiers are divided into ‘veteran’ and ‘young’. Veteran soldiers are those who have been in the army for more than two years; young soldiers less than two years. (Veteran soldiers are often younger than young soldiers.) Young soldiers aren’t supposed to drink milk. They risk getting beaten up if they do. I don’t know why. I learned that עד מתי!! is the clarion call of all soldiers. עד מתי is literally translated as until when? But the real meaning is how long is this going to last? עד מתי the boys would shout, as they slogged through mud and weeds on yet another night trek. עד מתי can be heard when they were told that their weekend leave was cancelled because there was intelligence that mischief was afoot, and more manpower was needed. עד מתי is whispered as the boys lay under the small amount of shade they could find trying to survive yet another 50° (C) summer day in the Judean Desert. I learned that pride and fear don't cancel each other out. Indeed, they egg each other on. My youngest son was officially released from the army yesterday. I can't stop crying. Until the next call up. עד מתי –Until when – will mothers and fathers cry?